The basic model unified diesel SMD is a 4-stroke 4-cylinder engine SMD-14 with 120 mm cylinder diameter and piston stroke equal to 140 mm. 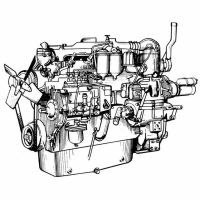 Engine power is 75 hp with crankshaft revolutions equal to 1700 rev / min. cylinder head, crankcase timing gear, a flywheel, and the pallet, he's sump, mounted on the crankcase, which is the main part of the housing. Fuel pump with variable speed governors and the booster pump, PD with a gear, a thin filter and prefilter, the nozzle spout for pouring oil masloizmereniya rod and located on the left side of the engine. Oil filter pump SOT, generator and exhaust manifold located on the right side. In the front part of the crankcase gear mounted water pump together with the fan (the impeller). Here it is worth and V-belt drive water pump, a fan, a generator, and on top of the gear housing cover put hour meter. At the rear of the engine to the cylinder head mounted air purifier. Intake manifold with starting preheater and drain pipe are placed directly on the cylinder head. The cylinder head with it is attached to the valve mechanism, in turn, covered with a lid cap breather.